As a kid, I remember enjoying cream of wheat and Coco Wheats. I really loved the latter, often attempting to make it myself and being frustrated by getting a lot of lumps in it. 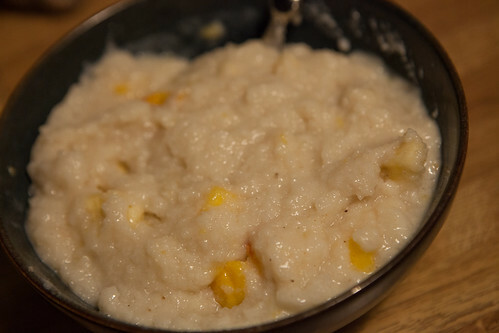 I haven't had cream of wheat in a long time, but a couple of weeks ago, I found a recipe for creamy rice cereal on Cathy Fisher's Straight Up Food web site or Facebook page. I can't find the recipe online now, but it's basically just one part uncooked (dry) brown rice to four parts water. Grind the rice to a fine powder in a blender (I use a Vitamix with blades optimized for dry foods), bring the water to a boil and whisk in the rice. The trick is to whisk constantly to avoid those pesky lumps. Then reduce heat to low and cook for five minutes. Since I have an electric stove, I had to lift the pan off the burner to stop the rice from boiling and splattering while the burner cooled down. I so wish I had a gas range. I enjoy this comfort food with soy or nut milk and fruit. Came in handy when I ran out of my usual oatmeal and quinoa.